A young man that I go to church with has made up some Tshirts with #TeamJesus on them and I love them. I want to make one with this Ephesians verse on the back. 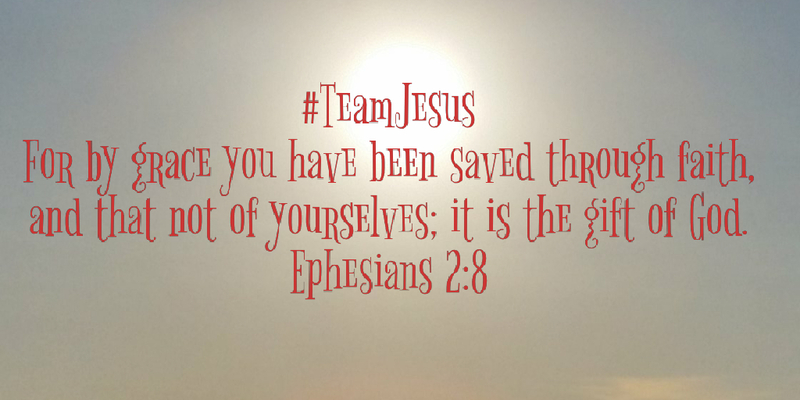 I love the idea of wearing a shirt with #TeamJesus on the front and then a verse on the back. I have been practicing with Memes a little. Let me know what you think. The Encounter, is a new original TV Series on PureFlix. I started watching it a few weeks ago and fell in love with the plot. The series is based on the original movie, The Encounter, starring Bruce Marchiano, who by the way makes a great Jesus. The theme of the series is that people encounter a mysterious man when they are at a crossroad in their lives and in need of change. If you haven't seen the movie, I would recommend watching that also. You can find it and the sequel to the first movie on PureFlix also. There is a new episode every Friday and to date I have watched four of the episodes. Each episode has a great meaning, and if you don't have PureFlix yet it is a great Christian based movie channel similiar to NetFlix. You can try to first month for free even, which is a great deal. I hope you like this new series. Let me know what you think. Copyright 2016 by Debra Bolocofsky. You are welcome to link to this site or use a single image and a brief description to link back to any post. Republishing any post in it's entirety is prohibited without permission. All images are the property of Debra Bolocofsky / Adorned In The Word / Adorned From Above. Do not reproduce without linkback or permission.